A colliery in an area that was served by many small collieries prior to it coming on stream in 1868 as the following advert announces. Derbyshire Times, 28th. March 1868 to Sinkers and Others. Tenders are requested for sinking a new shaft down to the Ashgate seam of coal near to the Chain Bar Brampton, sealed tenders endorsed "Tender for Sinking" and addressed to Mr. John Johnson Brampton Colliery offices to be delivered not later than 8th. April Next. The colliery worked using a horizontal pumping engine with a 16 inch link motion, and two 16 inch horizontal steam winding engines and drums manufactured by the local firm of Oliver and Co.
An accident occurred here in October 1871 when a miner from Brampton named William Bradshaw was killed in the pit bottom. He was transporting tubs to the shaft side and was of the opinion that the chair was in the pit bottom which it was not. The tubs ran away and fell some 15 yards into the sump at the bottom of the shaft which was full of water. As a result he himself was dragged with the tubs into the sump and killed. In July 1872 Walton Mill was put up for sale by Thomas Irving. A piece of the land was sold to the Midland Railway Company to provide access by rail to Brampton Colliery. In 1880 New Brampton Colliery was owned and operated by Knowles, Wright and Knowles. In 1896 the colliery was owned by J. Pearson and managed by T.D. Croudace with W. Holland as his under-manager. The colliery employed 39 men underground and 8 on the surface and produced machine coals from the Tupton and Threequarters seams. John Blair has now a full supply of really good Blackshale coal at 5/6d per ton at the pit. Cartage extra. Brampton 1/- per ton. Chesterfield 1/5d per ton. Derbyshire Times September 3rd. 1887. Brampton colliery was sold by auction on Thursday 27th March 1884 at the Angel Hotel Chesterfield. the auction started at 3:00pm to sell the colliery and plant. It comprised of winding and pumping engines, tubs and rails the colliery buildings including the engine house, offices and workshops and between four and five acres. Earlier in 1862 the colliery wanted 20-30 good pickmen and in 1866 the colliery was asking for an additional 50 men, to work in dry and steady employment winter and summer. 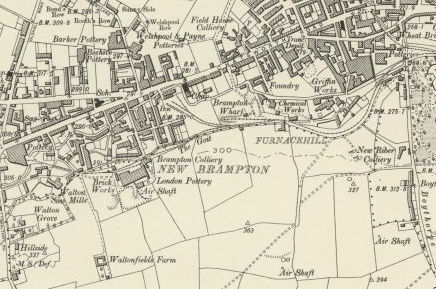 It would appear that there was also a New Brampton Colliery at Loundsley Green in 1861 run by Nichols and Fletcher. In the early Brampton collieries the seams were shallow and small and a man could not physically work on the coal in the conditions that prevailed and so small agile children were used in their place. Derbyshire Times. 3rd September 1864. To colliery owners and others – to be sold by auction opposite the National School Brampton a weighing machine calculated to weigh 4 tons, 10 coal wagons and pit corves. The sale is to commence at 1.00 p. m. at the Three Tuns Inn Chesterfield. Seam of coal near to the Chain Bar Brampton. Sealed tenders endorsed “Tender for Sinking” addressed to Mr. John Johnson Brampton colliery offices Chesterfield to be delivered not later than 8th April next. An inquest was held into the circumstances attending the death of Joseph Talbot pit sinker who was killed in a pit being sunk at Brampton the property of R. W. Jackson Esq. M. P. for West Hartlepool by an explosion of gas. Henry Walters stated that he was the manager of the Brampton coalmine. One shaft went down to the Blackshale coal about 65 yards. Another shaft is being sunk to the same coal and is about 36 yards down. The sinkers were engaged in putting some iron tubbing about 22 yards from the surface and they were working on a wooden scaffold suspended by four chains and strong hemp rope attached to the treble gear crab winch. Suddenly there was an explosion. Henry Walters manager to Ralph Jackson M. P. owner of Brampton colliery was summoned for contravention of the “Mines Regulations Act 1872” for not having published special rules in conspicuous places for inspection. The Inspector went into the Old Brampton colliery on the 10th November and into the engine house and found a connecting rod and crank unfenced. The third charge was for permitting gunpowder to go down the pit and to be used otherwise than as cartridges. On the 10th November he found in stall no. 21 some gunpowder in a tin canister. He also found gunpowder otherwise than in cartridges in a tin can. The Bench considered that they had to convict and they found the defendant £5 plus costs on each charge a total of £17- 13- 6d and told him that they had been lenient as the penalty could have been £20. Unscreened nuts 4/- per ton Pit slack 2/- per ton. Cash on Delivery. Derbyshire Times. 20th January 1877. Samuel Hoskins Manager of Brampton colliery was summoned for two offences against the Coal Mines Act. 1.By employing persons in the Cutthorpe colliery without there being two shafts communicating with each other. 2.For not causing an adequate amount of ventilation to be produced so as to dilute and render harmless the noxious gases in the pit. Since the Inspectors visit the pit had been closed and in consideration of that they had agreed to accept a penalty of £5 in the first case and £1 in the second case both with costs. Hand picked coal 9/6d, Screened coal 8/6d, Screened slack 4/-, pit slack 3/6d all prices per ton at the pit. For sale horizontal engine with 16 inch link motion by Oliver & Co. One pair of 16 inch horizontal winding engines and winding drums by Oliver & Co.
To be sold by auction on Thursday 27th March at 3.00.p.m. at the Angel Hotel Chesterfield the valuable colliery plant comprising of winding and pumping engines, pit tubs and rails the colliery buildings including engine house, office and workshops and between four and five acres of land.